Replacement: None. 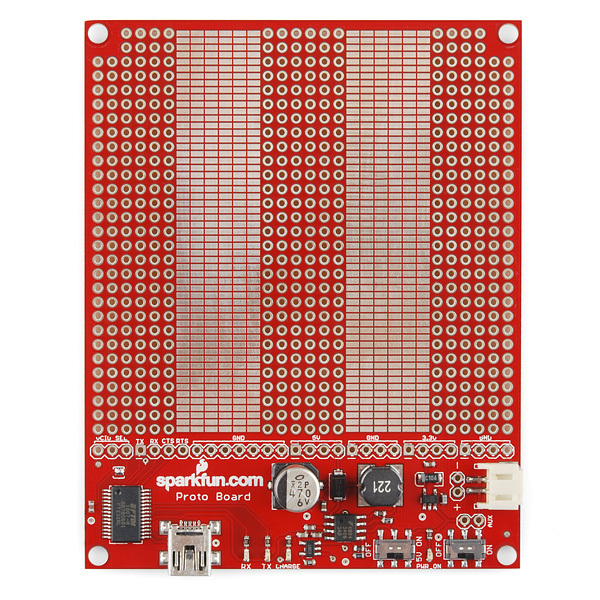 We are no longer carrying this ProtoBoard in our catalog. This page is for reference only. The marsupial naming convention is what happens when you let Engineers into a Marketing meeting. They looked so happy, we just couldn't tell them no. Diprotodon is the board with USB serial, charging, SMD proto, and PTH proto. 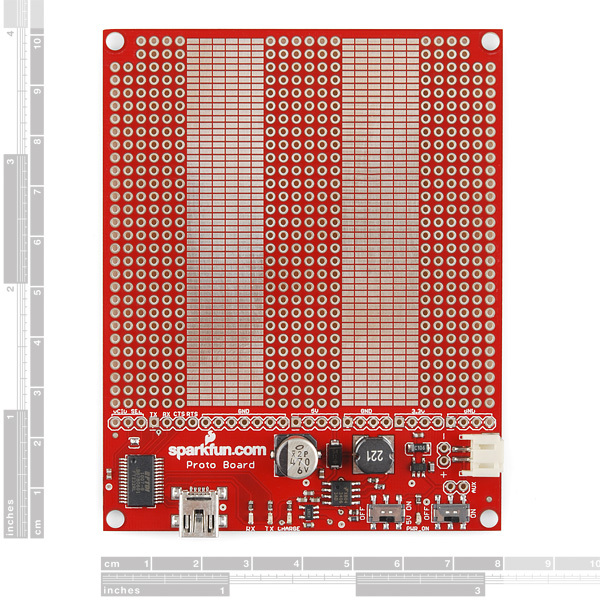 This is a project board specially designed to fit the Sparkfun Enclosures. 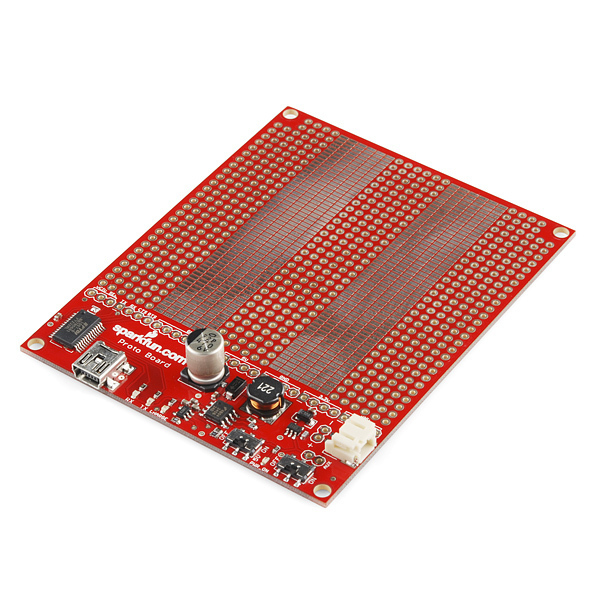 The board provides the user with 3.3V and 5V regulated rails from a single Lithium Polymer battery. USB serial communication is also on-board with an FTDI FT232 USB chip, with selectable 3.3V or 5V logic. The LiPo cell plugs into the provided JST connector, and charging is available over USB (100mA) or external source (5V, 250mA). Finally, the board has a generous prototyping area that allows a combination of surface mount (2.54mm x 1.27mm, 50mil x 100mil pads) and through-hole components (2.54mm, 100mil spaced holes). Note: This version has undergone some minor hardware changes including a slight change to the charging circuit and some footprint changes. It still works exactly the same way but the image to the right doesn't reflect the board changes. A new image will be added as soon as possible. This seems like a really good deal. Why isn't this more popular? My thought too. Their Bandicoot board also has a plated backside but no pads. With the PTH already masked, it shouldn't be too difficult to just duplicate the SMD pads as well. On the other hand, you can use it as ground plane for EMI shielding, I guess. The "shield" concept is MUCH more valuable than extra pads on the back. Bring back the diprotodon! I promise not to turn off the electric fence and let 'em out! is this compatible with RN52? Could someone with this board hook it up and let me know the current draw without any components installed? basically what does this thing pull off the battery while on. Will this protoboard work for my LPC1343 LQFP48 protyping? Is DTR exposed in this version? I didn;' see it in the datasheet. How would a (mini) breadboard fit on this? 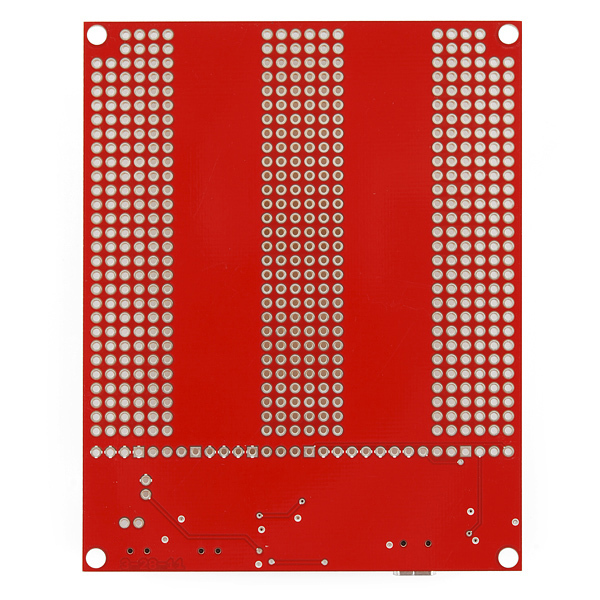 Would it block both rows of SMD proto area? Are the througholes all independent or are they wired like a breadboard? I personally think the breadboard style is much more useful. If you ever tie the holes together, let me know so I can buy my boards elsewhereâ¦ Iâd much rather connect the required holes together with bus wire than fight the process of using a blade to seperate unneeded pins.